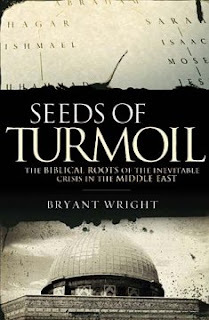 Seeds of Turmoil by Bryant Wright is an excellent resource on the Biblical roots of the Middle East conflict. The author takes you through the genealogy of Abraham, Isaac, and Jacob and the promises of God for their future generations. He also teaches about Sarah, Hagar and Ishmael, Rebeka, Jacob and Esau... their faith and lack of it, their waiting on God and their impatience that led to 'helping God out' to fulfill His promises to them. And how all of their decisions led to the crisis that is still going on in the Middle East today. For me, this was a very interesting book. At first I thought it repetitive, but after reading, I realized it helped me commit more to memory. I have read the Bible for years, read about all the people the author speaks of, and heard or read about the crisis in the Middle East. For the first time... I have a very CLEAR understanding of who these people are, their religions, the decisions they made and how those decisions affected the crisis in the Middle East and the fighting over Israel. This book helped to put it all together for me like never before. Not only does it help in understanding Biblical history and genealogy, the Middle East and Israel... it has some valuable lessons to be learned as well. It teaches what can happen when we choose to go ahead of God or to 'help God out' as the author puts it. It teaches that our decisions can have an effect like we could never imagine. Maybe for generations to come. All in all.... I found some valuable information and great lessons to ponder. I would recommend this to anyone trying to understand Biblical history or the crisis in the Middle East. A Tip For Mom's With Kids in Diapers! Perfect little devotional for women!